If you're looking for a great resource for teaching your kids about the United States, check out Time for Learning States by Lynne Blanton and Betsy Hedberg. This is a fabulous resource for young kids ~ and old, I suppose. The book is filled with facts that are presented in a fun and engaging way. Each of the 50 states, and Washington D.C., gets a 1 or 2-page spread. There are standard facts about the states, such as the capital, nickname, state flower or motto. And there is usually a paragraph or two about the history of the state. 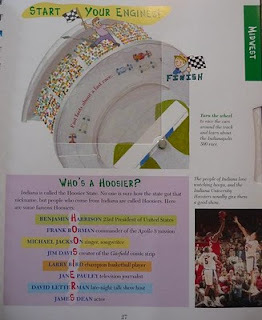 But many of the facts included in the book are more interesting for younger kids. 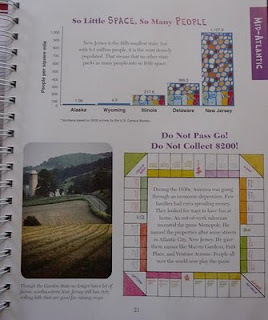 For example, the New Jersey page talks about how the game Monopoly features streets from Atlantic City, NJ. 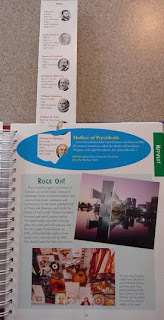 And the Ohio page talks about the Rock and Roll Hall of Fame and Museum. The West Virginia page mentions that it's a great place to go white-water rafting. And the Montana page tells us about Grasshopper Glacier where you can see grasshoppers frozen in the ice. 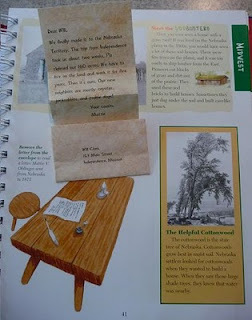 I've been using this book with my two kids ~ ages 5 1/2 and almost 3 ~ as we work on our Tuesday Travels geography project on my other blog. 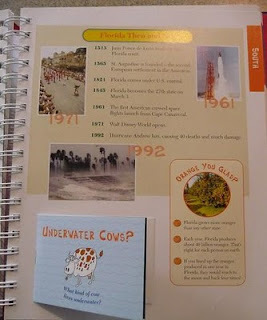 And they've been enjoying reading about the different states from which we've received postcards. It's good for their ages, but I think it would be great for older elementary school kids as well. This review was written based on a copy of Time for Learning States that I purchased. I am thinking of doing United States next year as a big project. Then this book will sure comes handy - thanks for this review! Great review. I'm more convinced than ever I want to get this. Looks like a great book, J! Thanks for the tips! This looks really good--I'm always looking for stuff like this! Thanks for sharing. Have you seen The United Tweets of America: 50 State Birds and Their Stories by Hudson Talbott? We have that one and have enjoyed reading it together. It's geared to school-age children, so it's a bit much for my 3 year old, but we love the illustrations and have managed to learn a few interesting facts about both the states and the birds.